A FOX invited a Crane to supper and provided nothing for his entertainment but some soup made of lentils, which was poured out into a broad flat stone dish. The soup fell out of the long bill of the Crane at every mouthful, and his vexation at not being able to eat afforded the Fox much amusement. The Crane, in his turn, asked the Fox to sup with him, and set before her a flagon with a long narrow mouth, so that he could easily insert his neck and enjoy its contents at his leisure. The Fox, unable even to taste it, met with a fitting requital, after the fashion of her own hospitality. This Aesop’s fable has surprising levels of complexity. I’ve wondered: did the fox serve that inedible meal to the crane on purpose? Reynard the Fox is known in many cultures as a trickster, so this is likely. Or, did the fox just experience schadenfreude — pleasure at another’s misfortune — when the Crane unexpectedly made a mess of the meal? Does it make a difference? In some versions it is explained that the fox deliberately made it impossible for the crane to eat because the crane came mooching for a free meal and there wasn’t enough to go around. La Fonatine (1558) describes the fox as sly, and a frugal liver. Does this make a difference? In this version, the fox is a woman; in the version by La Fonatine is was the crane who was female. Caxton, writing in 1484 had a male fox and female crane; other translators pegged them both as male. Does this make a difference? When we teach classes on nonviolence, we talk a lot about how to break cycles of violence. 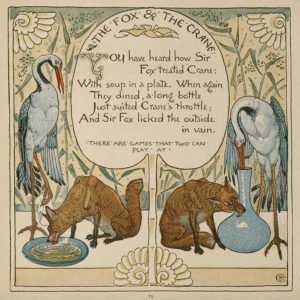 The Crane could have nipped this in the bud by being gracious and serving the fox in a shallow bowl so he could lap his meal with his tongue, as was his preference, while serving her own meal in the tall flagon more suited to her long beak. Instead, she chose payback. Is there a hero in this story, or were they both behaving badly? Did the friendship survive? Did they consider themselves “even”? Or did this little game go on, and on, and on . . . Or did they end their friendship? I’d like to know. Different versions give slightly different “morals” to the story. Caxton starts his story with a warning: “Thow oughtest not to doo to other that whiche thow woldest not that men shold doo to the” In other words, the golden rule. He ends it though, with quite a different moral: “And therfore he that begyleth other / is oftyme begyled hym self /” I don’t know what “begyleth means either — perhaps trick, tease, cheat. In any case, it’s not nice. Caxton is saying here, “What goes around, comes around.” La Fonatine seems to agree: “Ye knaves, for you is this recital, / You’ll often meet Dame Stork’s requital.” Expect others to treat you the way you treat them. In Joseph Jacob’s 1894 version he suggests that the moral is: “One bad turn deserves another.” Revenge is sweet. L’Estrange (1692) seems to agree. His moral is: “Tis allowable . . . to pay him in his own Coin” Quite a different point to the story. 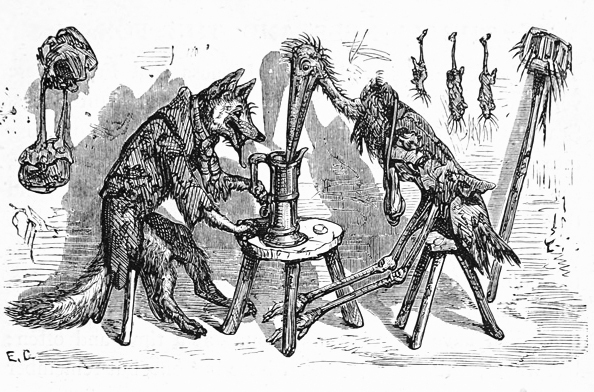 The version in the illustration below is from “Baby’s Own Aesop (1887) written by W.J. Linton but best known for Walter Crane’s illustrations. What do you think?